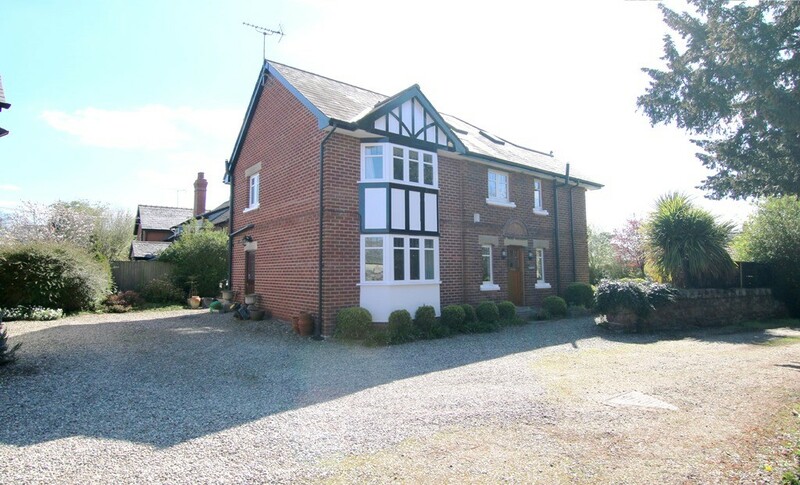 NO ONWARD CHAIN: Set on a secluded, no-through road within the premier village of Pulford; this distinctive detached residence offers substantial accommodation over 3 floors. 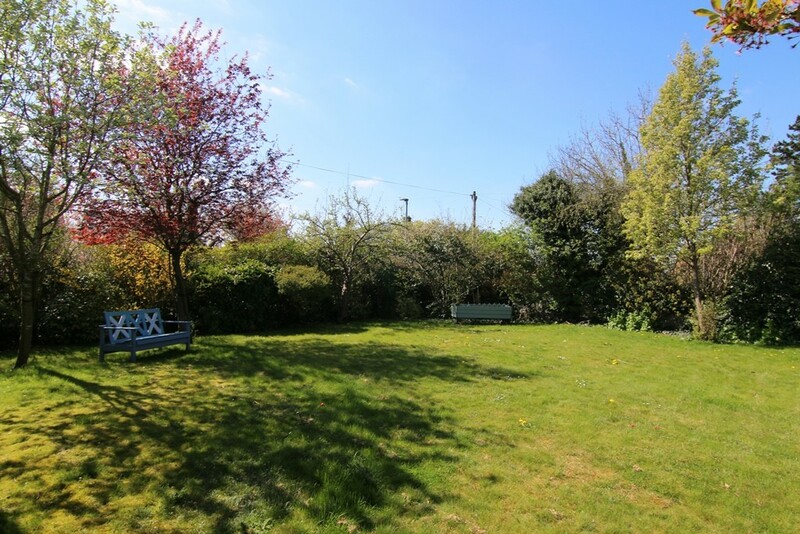 Enjoying private, South-facing gardens, ample parking, detached garage & studio annex with shower room over. Viewing Essential. 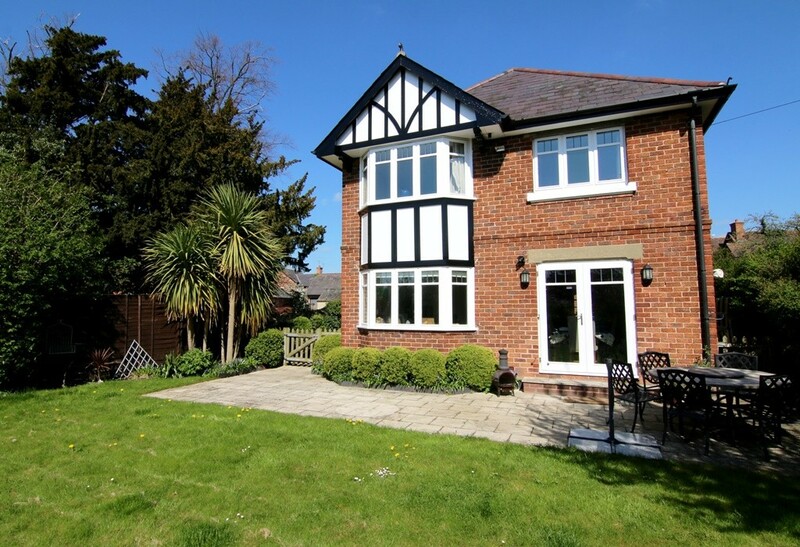 SUMMARY NO ONWARD CHAIN: Set on a secluded, no-through road within the premier village of Pulford; this distinctive detached residence offers substantial accommodation over 3 floors. 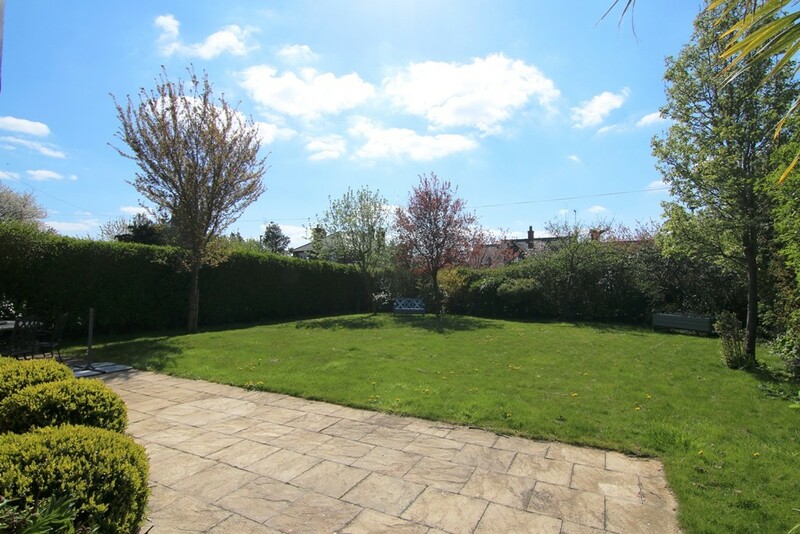 Enjoying private, South-facing gardens, ample parking, detached garage & studio annex with shower room over. Viewing Essential. 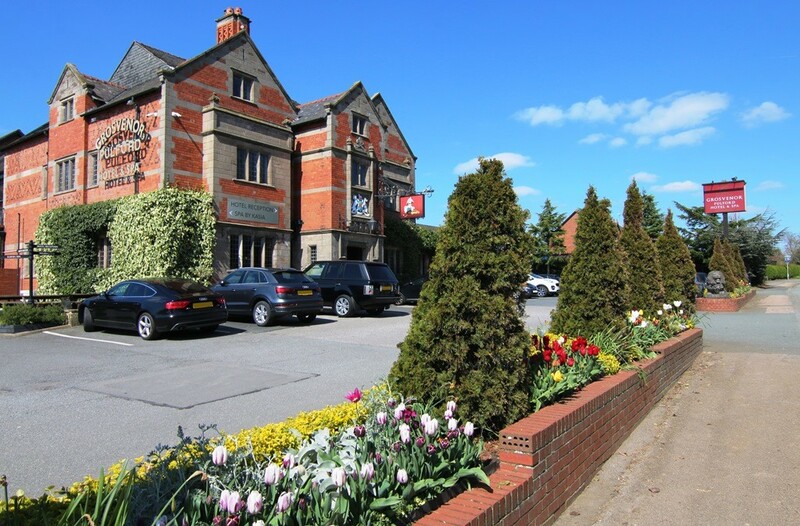 INTRODUCTION Pulford has long been one of Chester's premier villages with local amenities including the excellent Grosvenor Pulford Hotel and Spa which is within walking distance and boasts a variety of restaurants, hair and beauty salons along with golf school and golf courses nearby. 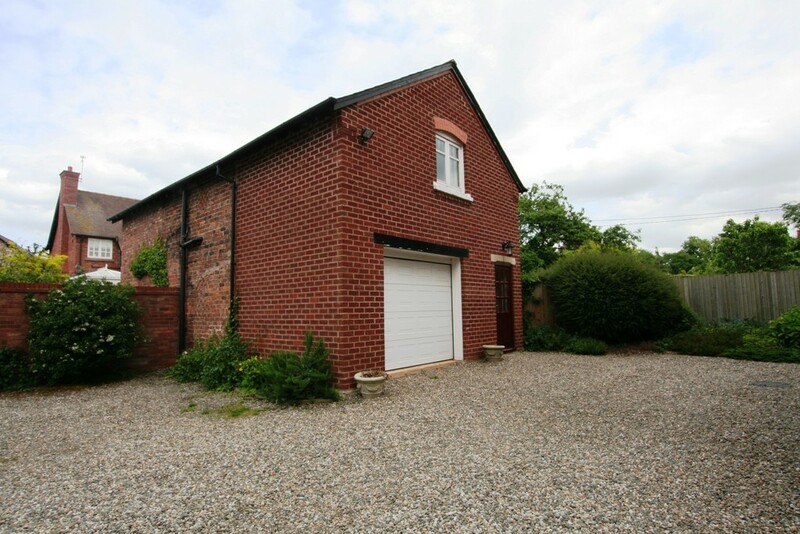 Primary & Secondary schools for all ages are within easy driving distance as is the A55 express way for those who like to get away at the weekend. 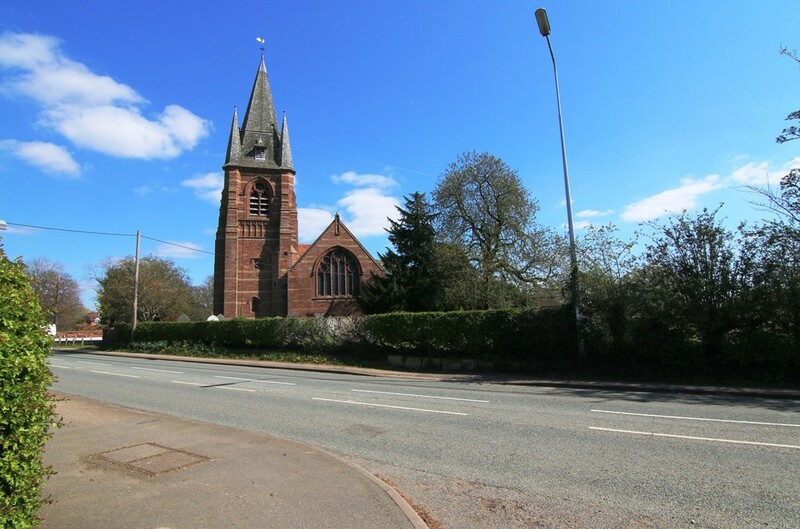 The village of Pulford is on a Bus Route to Chester. The property itself is an individual offering that has to be seen, set amongst a few high calibre individual family homes approached by a private, stone-walled no-through road. 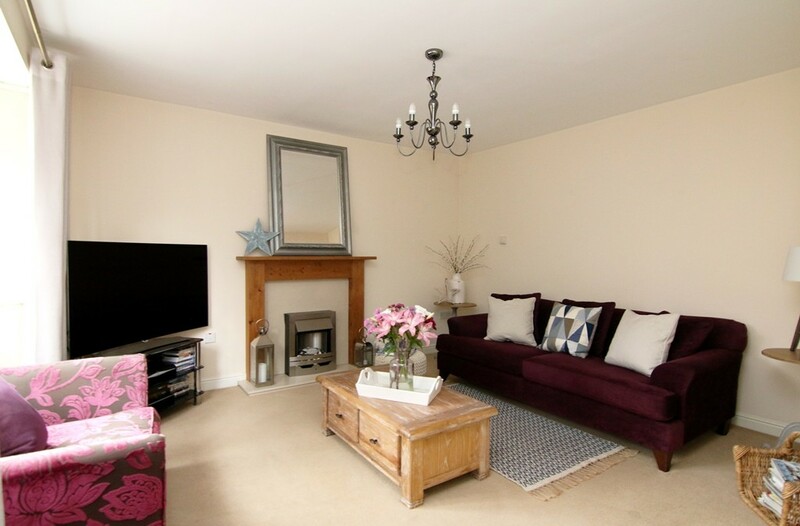 The spacious accommodation is over three floors with a family room enjoying the South-facing garden in the style arrangement of a sitting room opening into the spacious dining kitchen. 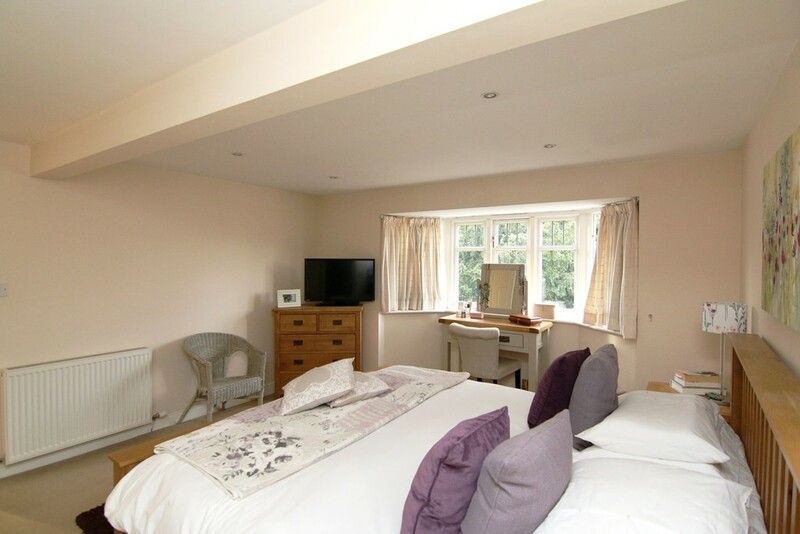 There is a separate lounge and the master bedroom enjoys a walk-in wardrobe and four-piece ensuite bathroom. 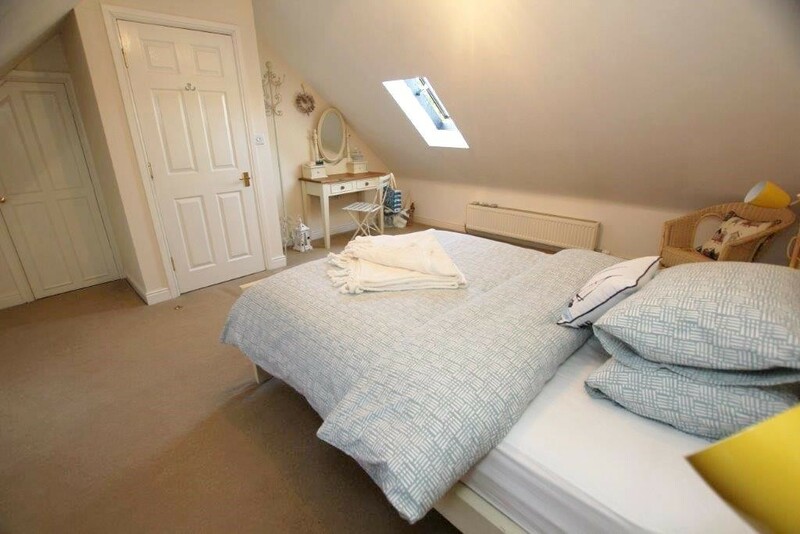 The top floor hosts the second and fifth bedrooms which share a third bathroom. 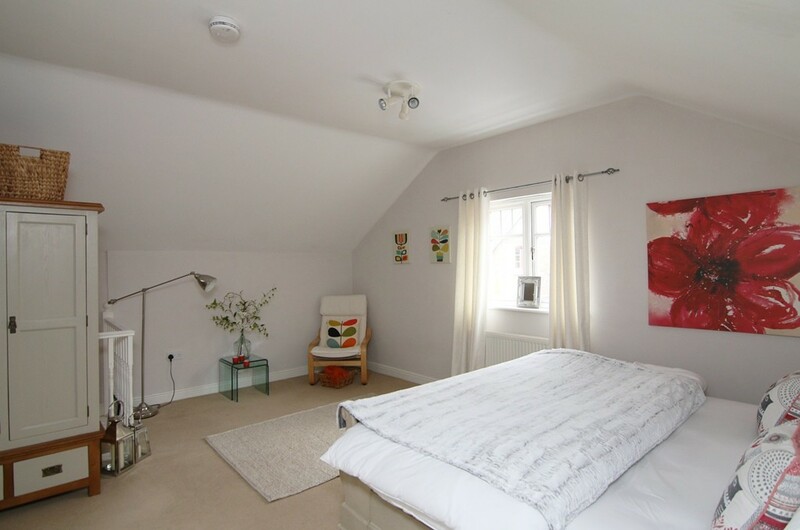 And to cater for guests or family members needing their own space the studio room over the detached garage is ideal having its own entry, central heating and shower room. 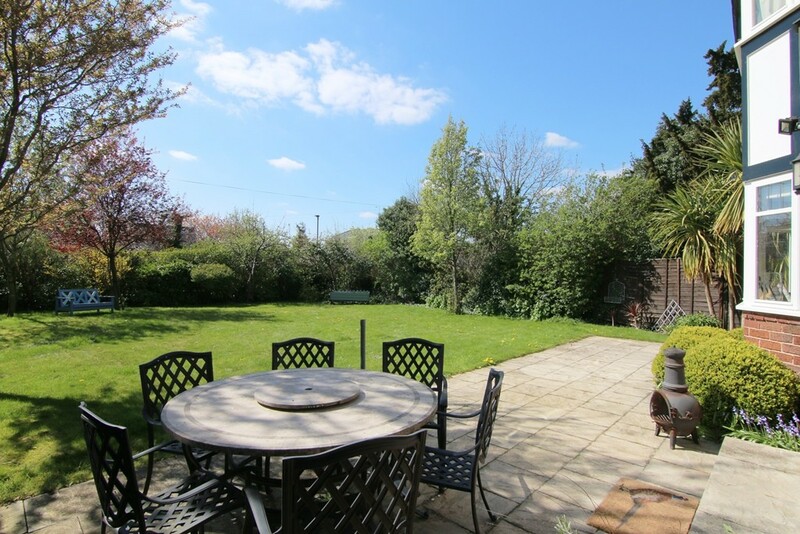 The parkland-style South-facing garden really makes this a fine home with a pleasing variety of colour and a large stone patio with ample space for garden furniture. FRONT ASPECT The property is approached by a private, stone-walled no-through road and is set to the right-hand side with the frontage laid to attractive shingle which turns to a matching foot path complemented with planted borders to both sides running towards the garden gate to the right-hand side. Stone steps lead up to a part-glazed Oak door having coach lamp effect courtesy lights to either side leading to the entrance hall. 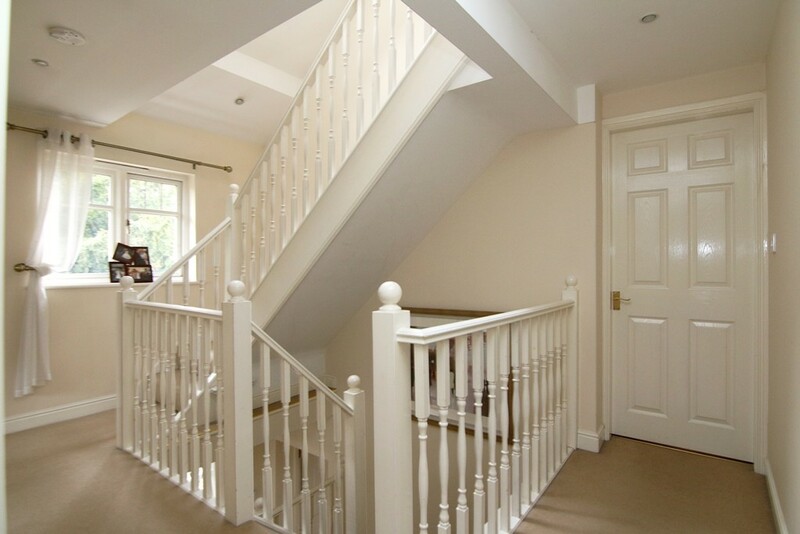 HALL Featuring an attractive timber turning staircase with full height door to generous storage under and attractive timber herringbone floor creating an instant first impression. Recessed lights, front facing window, doors to all principal rooms, and double panelled radiator with thermostatic valve. LOUNGE 14' 10" x 13' 1" (4.52m x 3.99m) Enjoying a front facing bay window ensuring plenty of natural light and featuring an electric flame-effect fire set in a marble and Oak surround with marble hearth and Oak mantle over. Five-way chandelier-style light, fitted carpet. 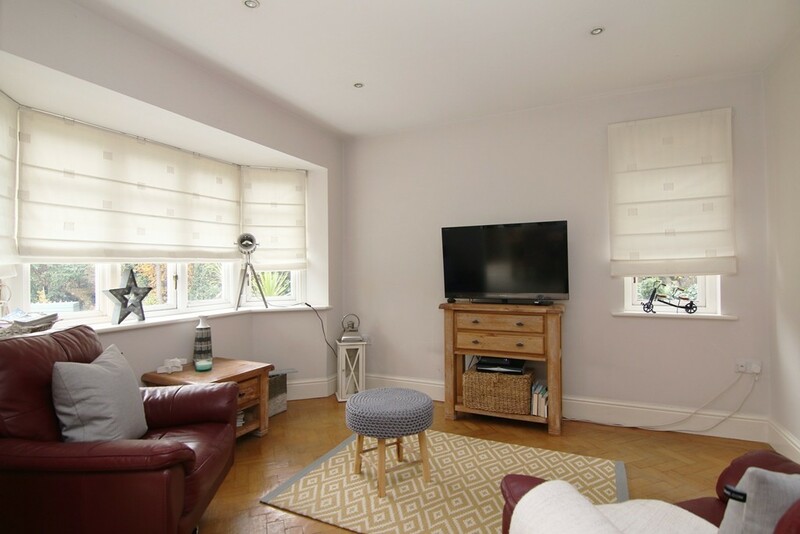 SITTING ROOM 13' 3" x 9' 11" (4.04m x 3.02m) Enjoying a dual aspect with a large bay window to the garden with views and an additional front facing window, both fitted with blinds and provided plenty of natural light. Recessed spot lighting, attractive timber herringbone floor to match that of the entrance hall. DINING KITCHEN 24' 7" x 11' 6" (7.49m x 3.51m) The kitchen is fitted with a range of base and eye level units with under pelmet and under unit lighting, granite countertop incorporating a one and a half bowl stainless steel sink with swan neck mixer tap, etched drainer and tiled surrounds. 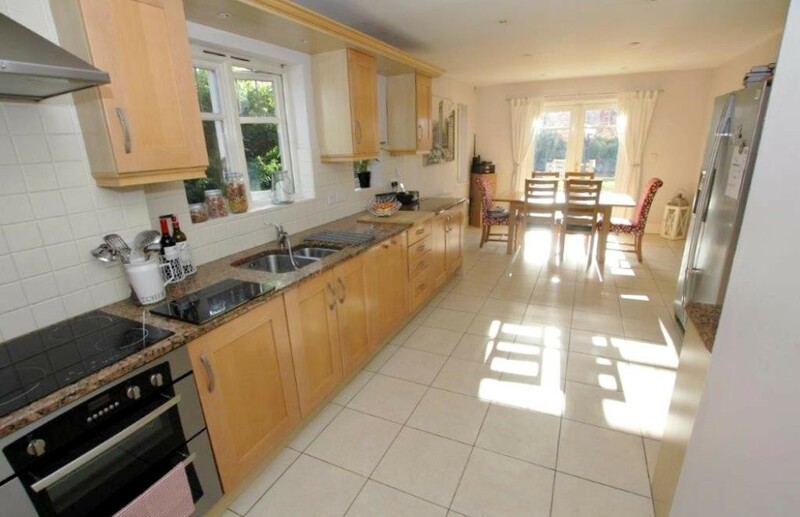 Featuring a range of integrated appliances including fan assisted electric oven, four ring induction hob with extractor over, microwave oven, dish washer, and space for an American-style fridge/freezer. 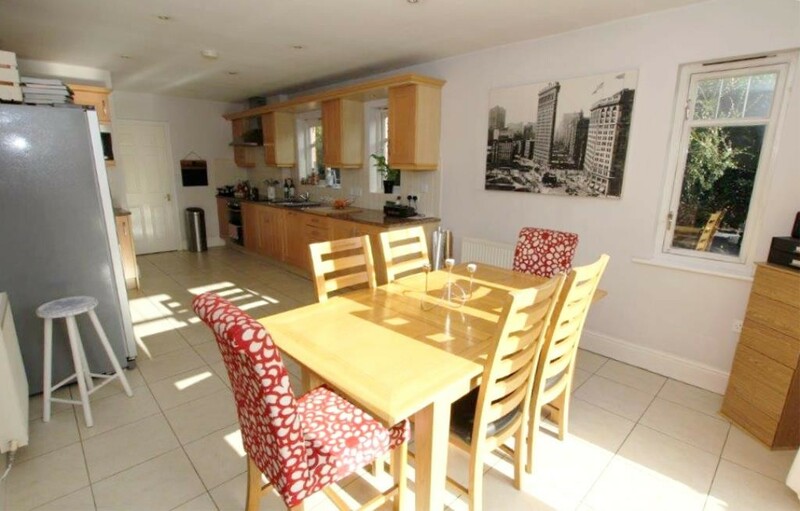 The dining area enjoys views of the garden where double doors lead out onto the patio and a further window faces the footpath that runs the rear of the property. 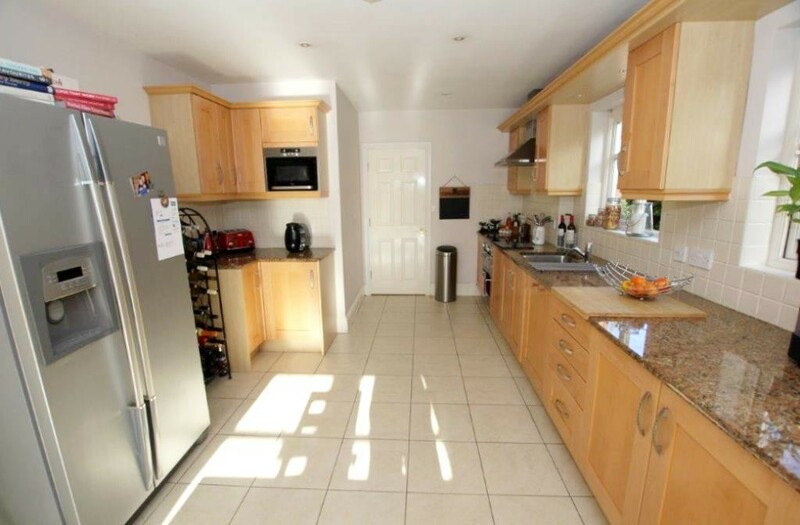 Recessed spotlights, doors to hallway and to utility room and tiled floor. UTILITY ROOM 9' 10" x 8' 2" (3m x 2.49m) Fitted with a range of base and eye level units with work surface over, stainless-steel sink and drainer with matching tiled surround and space under for a washing machine and the floor-mounted oil-fired boiler. 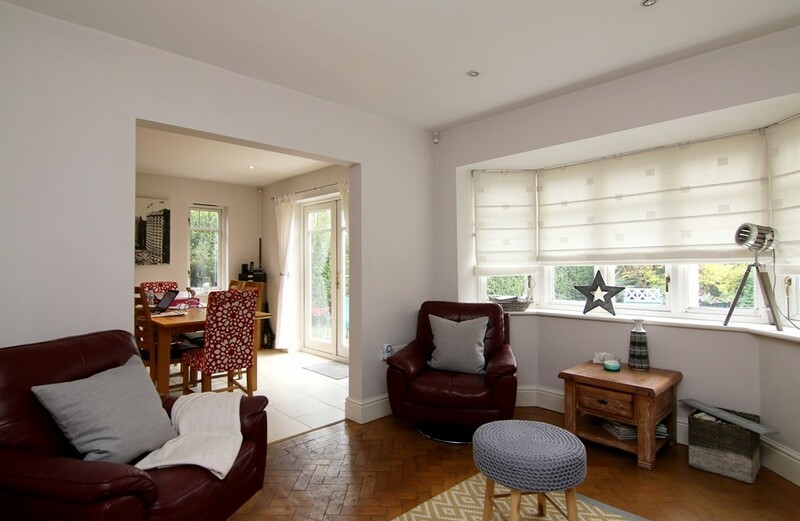 Recessed spotlights, rear facing window, door to cloakroom w/c, part-glazed stable door to side aspect and tiled floor matching the dining kitchen. 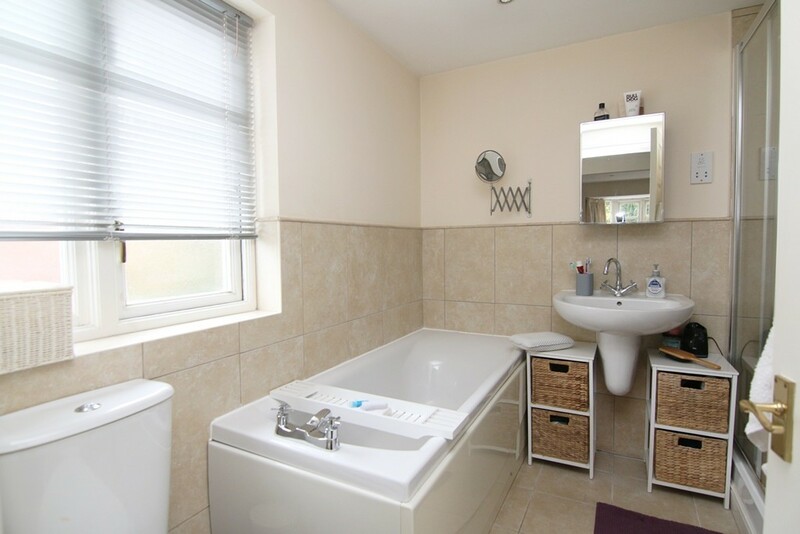 CLOAKROOM W/C Fitted with a two-piece suite comprising wash basin with tiled splash backs and a low-level w/c. Recessed spotlight, extractor fan, mirror, rear-facing frosted window and tiled floor. FIRST FLOOR LANDING With white timber spindled staircase leading up to bedrooms two, five and bathroom, front facing window, recessed spotlights, radiator with thermostatic valve and fitted carpet. 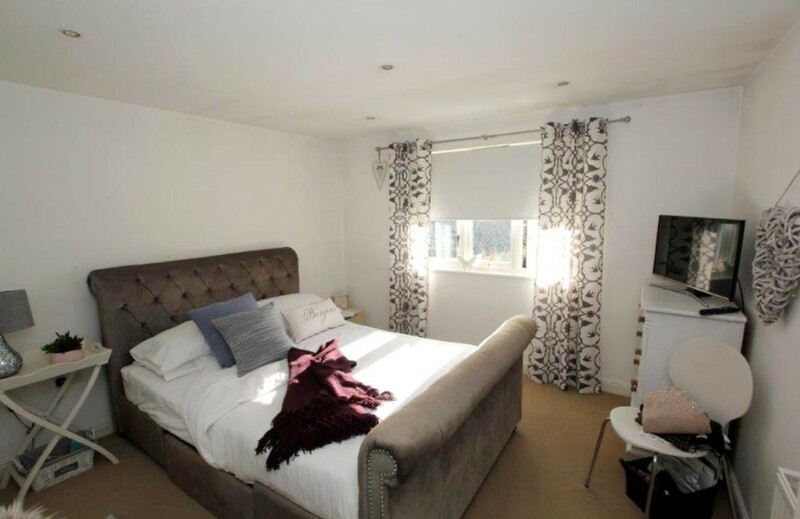 White painted doors lead to the master bedroom, bedrooms three and four and the bathroom. 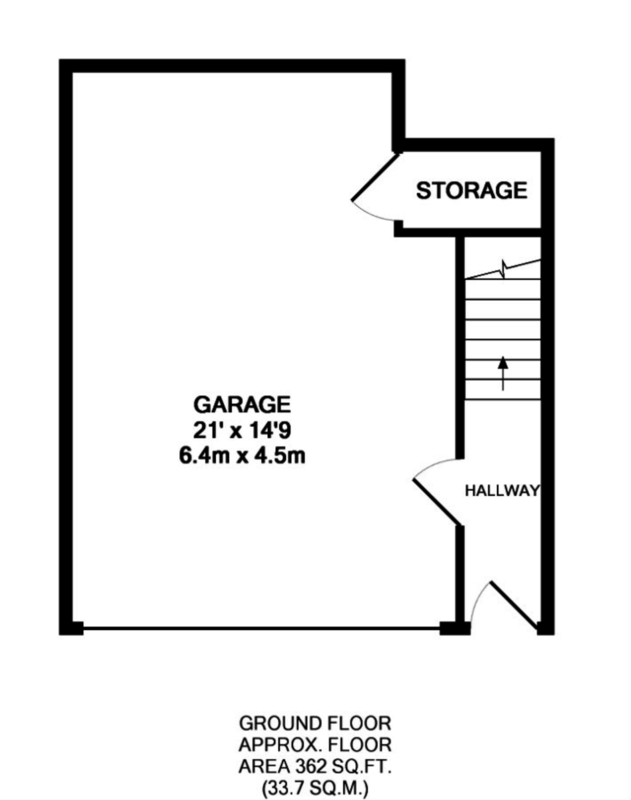 DRESSING ROOM 8' 2" x 8' 2" (2.49m x 2.49m) Providing ample storage having extensive hanging rails, angled shelving for basket drawers or display, further overhead shelving and cloak pegs. Recessed spotlights, radiator with thermostatic valve and fitted carpet. MASTER ENSUITE A luxury master ensuite bathroom featuring a four-piece suite comprising deep panelled bath with chrome mixer tap, spacious tiled shower enclosure with integrated thermostatic shower and glazed sliding door, wash basin with chrome mixer tap, and low-level w/c complemented with half tiled walls. Recessed spotlights, mirrored medicine cabinet, heated towel rail, shaver outlet, frosted window with Venetian blind and tiled flooring. 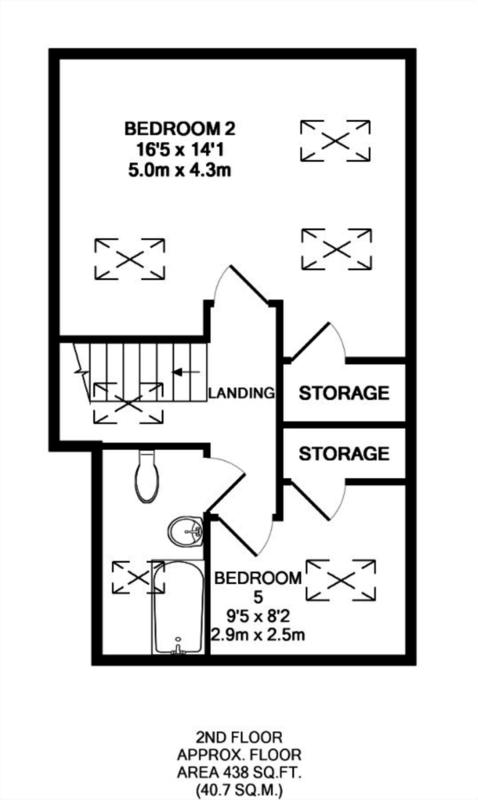 BEDROOM THREE 11' 7" x 11' 6" (3.53m x 3.51m) Enjoying garden views and having two integrated wardrobes both having hanging rails - one with double hanging and both with shelf over and fitted carpet. Recessed spotlights, fitted carpet. BEDROOM FOUR 13' 2" x 9' 10" (4.01m x 3m) Enjoying a dual aspect with garden facing bay window and a further front-facing window. Recessed spotlights, fitted carpet. FIRST FLOOR BATHROOM 9' 9" x 8' 2" (2.97m x 2.49m) Fitted with a four-piece suite comprising of a deep panelled bath with chrome swan neck mixer tap and hand shower attachment, glass and tiled shower cubicle with integrated mixer shower, wash basin with chrome mixer tap, and low-level w/c. Recessed spot lights, extractor fan, frosted window with Venetian blind, mirror, heated towel rail and tiled flooring. 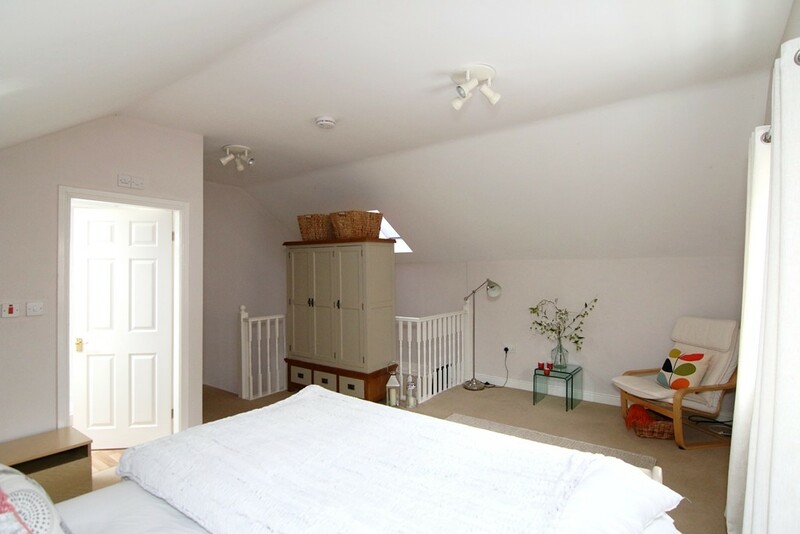 SECOND FLOOR LANDING Featuring a vaulted ceiling with sky light window and thee-way light, doors to all principal rooms and fitted carpet. 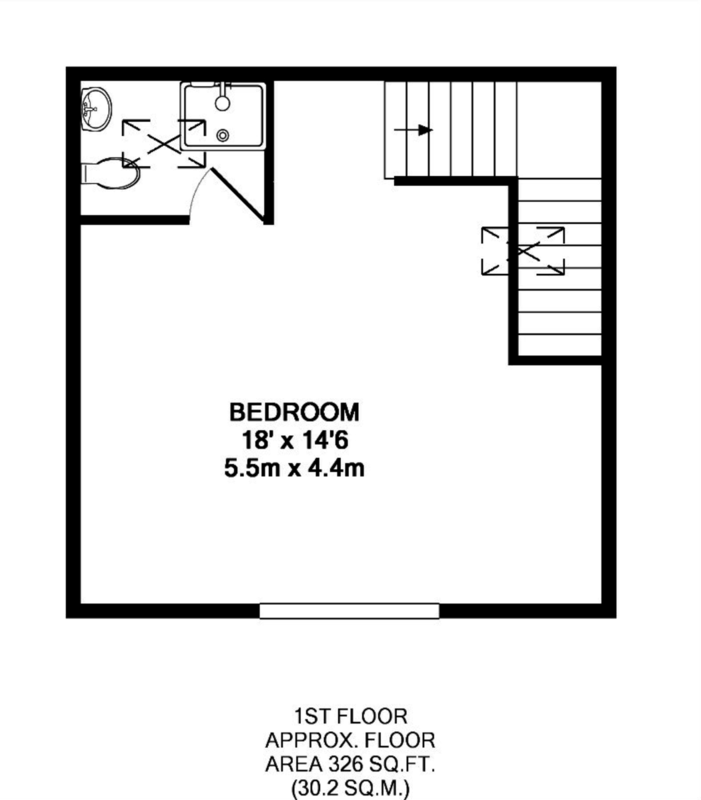 BEDROOM TWO 16' 5" x 14' 1" (5m x 4.29m) This large double bedroom enjoys skylight windows, two with blinds, fitted storage with hanging rails and fitted carpet. BEDROOM FIVE 9' 5" x 8' 2" (2.87m x 2.49m) Also enjoying a skylight window and fitted storage with hanging rails and fitted carpet. 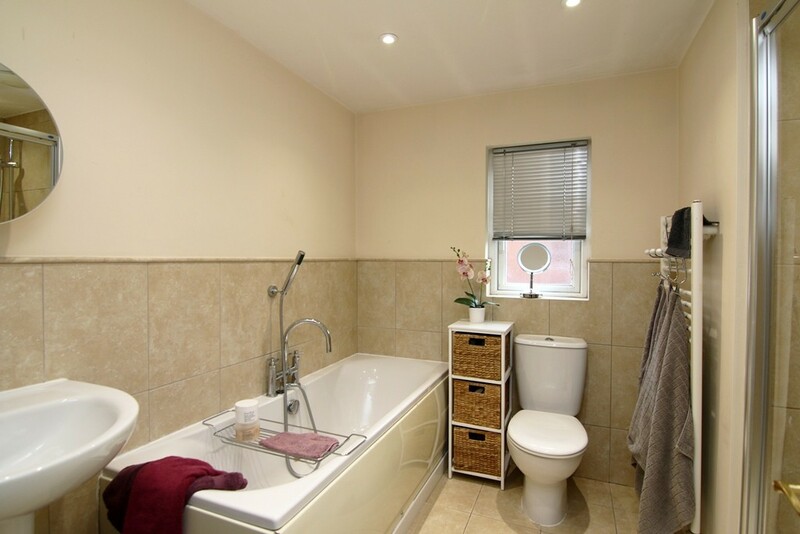 SECOND FLOOR BATHROOM Fitted with a three-piece suite comprising deep panelled bath with chrome mixer tap and hand shower attachment, pedestal wash basin with chrome mixer tap and low-level w/c with tiled surround. 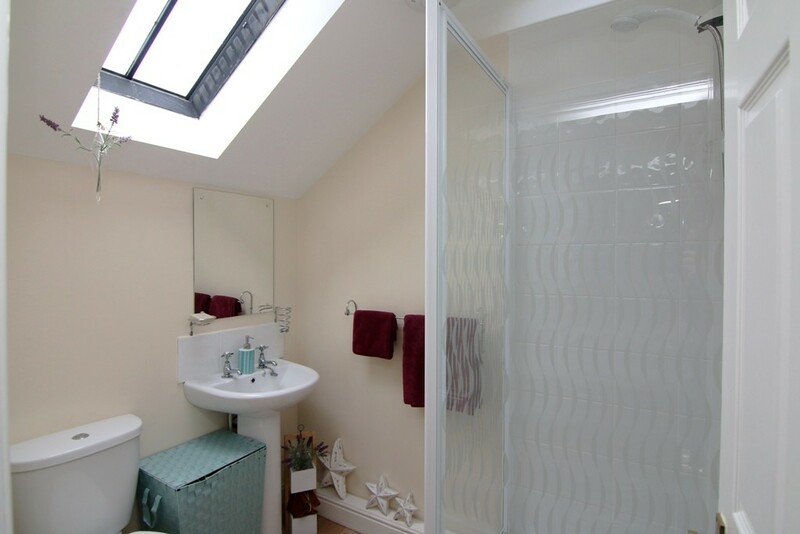 Skylight window, recessed spot lights, mirrored medicine cabinet, shaver point, radiator with thermostatic valve, door to eaves storage and tiled flooring. 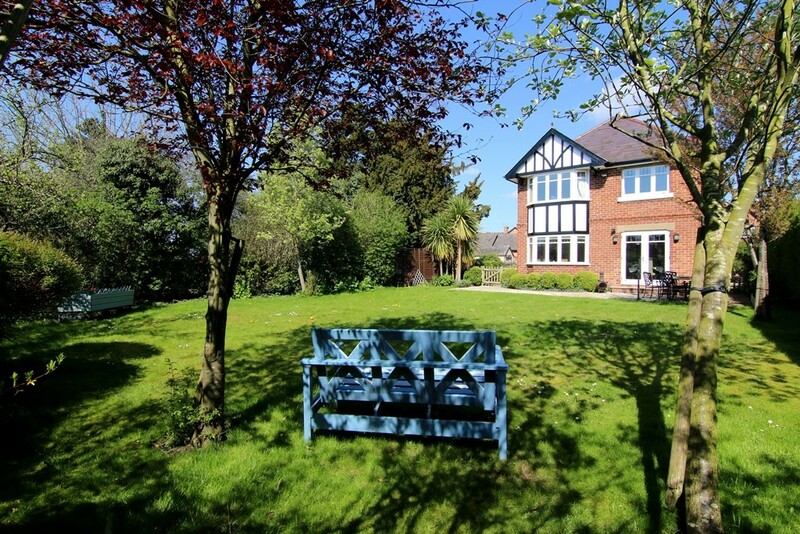 GARDEN This South-facing, parkland-style garden mainly laid to lawn with established boundary hedging providing privacy and featuring a variety of planting and seating areas. Featuring a stone patio running the width of the property accessed from the dining kitchen with courtesy lights and wall-mounted heater creating an ideal external entertainment space with further gated access to the front and rear aspects and external water point. DETACHED ANNEX Detached from the main house, a useful two-storey annex comprising garage with vehicular door, separate entry with external pedestrian door and integral door to the garage with staircase to the first floor, spacious room over currently setup as a guest studio and fitted bathroom currently servicing the guest bedroom. ENTRY Part glazed timber door with coach lamp effect courtesy light to entrance hall, the hall having door to integral garage, carpeted stairs to studio over, light and fitted carpet. INTEGRAL GARAGE 21' x 14' 9" (6.4m x 4.5m) Three fluorescent strip lights, door to under stairs storage, power, and concrete floor. With up and over remote-controlled vehicular door, integral pedestrian door. 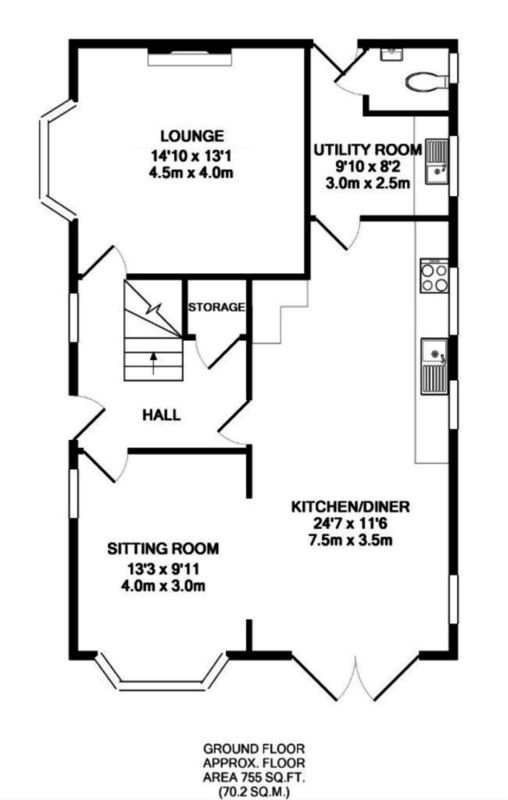 STUDIO 18' x 14' 6" (5.49m x 4.42m) Suitable for a variety of uses including games room, playroom, or home office and currently in use as guest accommodation, a bright and spacious studio. 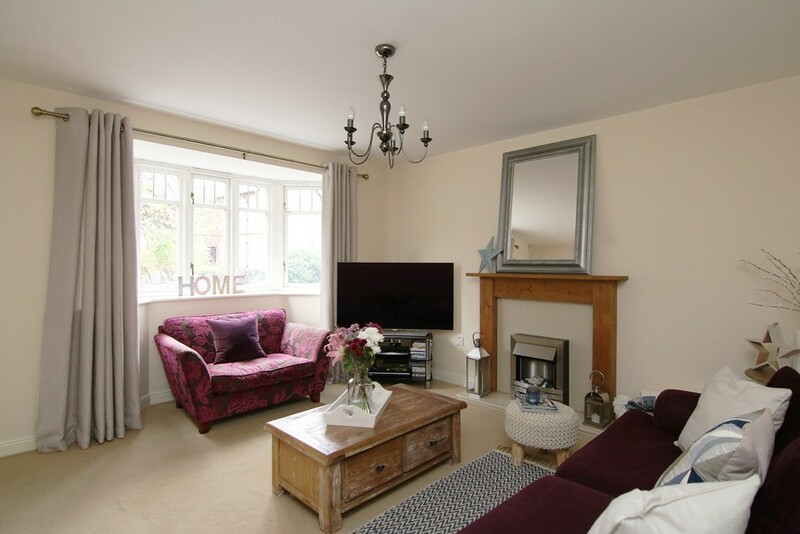 Featuring a skylight and further front-facing window ensuring plenty of natural light. Three three-way spot lights, double panelled radiator with thermostatic valve and fitted carpet. Door to shower room. 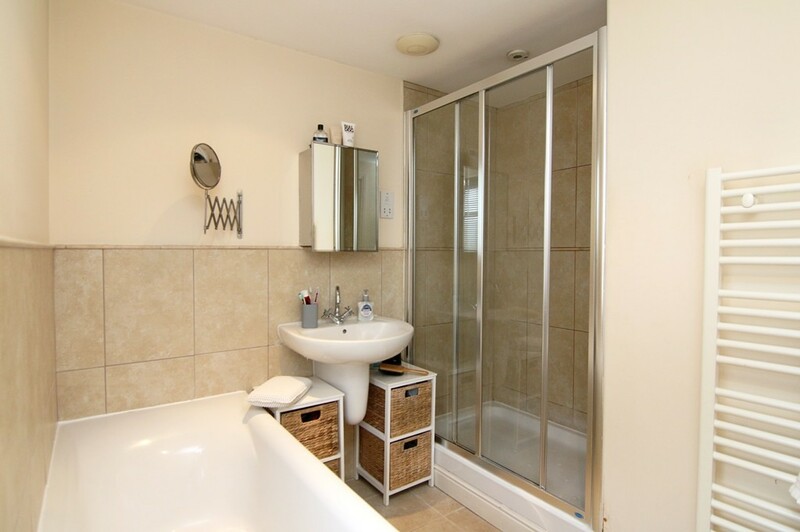 STUDIO SHOWER ROOM Having a three-piece suite comprising glass and tiled shower enclosure with electric shower over, pedestal wash basin with chrome taps, tiled splash backs and low-level w/c. Skylight window, mirror, towel rail, single panelled radiator with thermostatic valve and vinyl flooring. 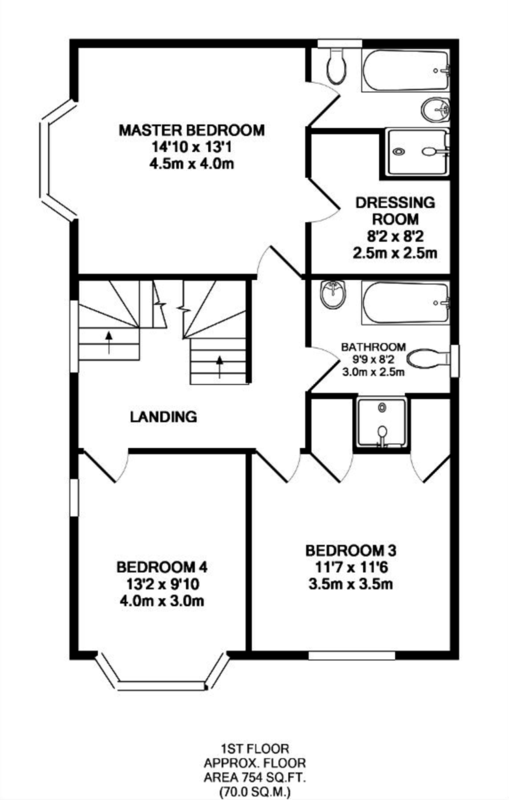 FLOORPLANS These plans are included as a service to our customers and is intended as a GUIDE TO LAYOUT only. Dimensions are approximate.